Recently I have been fortunate to take part in several collaborations with businesses. This little blog is just a (very time consuming) hobby so it is always flattering to be contacted by a store and asked to review a product. When I was asked to review a product from Zuri Zuri by Flora I was thrilled. Their premise of clothing is to make quality, stylish pieces for a reasonable cost. Umm, that is like my shopping motto. Brilliant! It's a match made in fashion heaven! I've been wanting more florals in my closet so when they sent me this gorgeous, silky blouse I couldn't wait to wear it. I tried to make it work for fall and add some edge with my jacket to make it work for a date night. I just love the bright colors and can't wait to wear it more, especially this coming spring! It can easily be dressed up or down and with all the colors it fits right in with my closet! See how else I've worn this jacket here! This is a really pretty blouse, and looks great with your jacket! I LOVE the combination of the floral blouse with the jacket. You look amazing! Such a great moto jacket and love those heels!! Fall florals -- I love it! WOW those heels and your jacket are gorgeous. You know I also own an olive moto jacket. Thanks for inspiring me, Laura. Link up this outfit tomorrow with Marissa from The Modern Austen because it is perfect for the color Cypress. She is doing a Pantone-themed week. Laura you are looking stunning in this outfit! One of my favorites recently. The color combo of the floral and olive jacket is great. I love that you added in such a fun shoe. Zuri Zuri sounds like my kind of place. Love the pretty mix of floral with the edginess of the moto jacket and those heels! Such a great outfit! Your floral blouse is so pretty and this jacket is a gem. I just love this combination and seriously how perfect is that floral blouse?! You are going to get a lot of wear out of it for sure. I'm so jealous that you can still wear open toe shoes! And hooray for you getting so many opportunities to review products. That sounds so fun. This jacket really looks perfect for this time of year. Cute jacket. And, I am jealous, too, that you are still able to wear open toe shoes. We had our first major snow last night. Not ready for all this cold weather! I love love love florals! This blouse is so pretty! And that jacket - I kind of want to steal it! Also, I wanted to let you know that I completely forgot about "tour through blogosphere" for this week - baby is due Thursday and I have been kind of distracted :) It's going to happen though! That is a great motto for shopping! 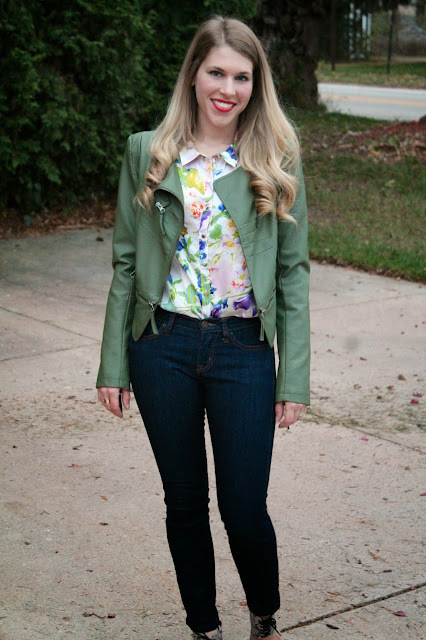 I haven't heard of this brand--can't wait to check them out :) This floral blouse is fabulous--paired so great with the moto jacket--love it! Feminine blouse with muscular motor jacket, how soft and tough at the same time! This green jacket is one of favorites. It seems like green is coming its way to me next year. BTW, MY Oasap dress came. I totally agree with you that the quality is fairly reasonable compared to the price. I love it! What a lovely look! I love the green jacket with that beautiful floral blouse! What a cute look! I love that shade of lipstick on you! This is one of my favourite looks on you. Your floral blouse is beautiful, love your jacket and your sandals. You look great. We took these a little while ago. It's definitely too cold now! I might be able to manage it for a date night but that's it! 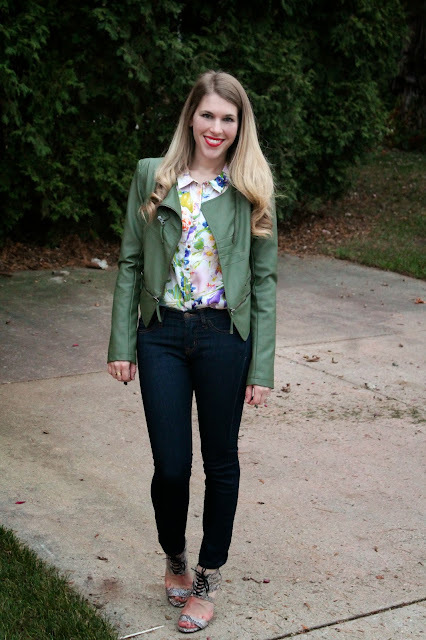 I love the floral blouse but I also love this green jacket! So refreshing and perfect for fall! Love this outfit so much! That jacket is so perfect and I'm in love with the color! i really adore this outfit! i think it is one of the best you've showed us!love the floral, the colors and the shoes! I love this jacket on you, and it always so fun and wonderful when a brand wants to work with you - congrats! You certainly have been working those collaborations girl! Good for you! Love the top! And well, the jacket too, but I'm biased! Ummm gorgeous! You look absolutely wonderful. It's the perfect look for a classy date night. THIS jacket is amazing, seriously amazing! Okay, so I know this post is about that pretty blouse, but for me, that awesome jacket takes the spotlight! I just love how unique it is, and the edge that it adds to your outfit!! !